This is not punk rock but it is a punk record ... I repeat this is not punk rock but it is a punk record. 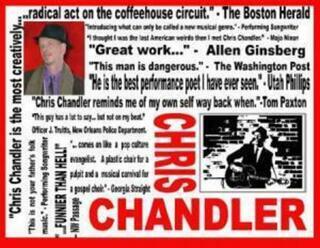 Chris Chandler is a spoken word artist of the highest level, he mixes humor with politics better than most people past or present, and he is a master storyteller. With songs covering topics from solidarity amongst people, the Fountain of Youth, and the lack of mainstream political music these days. It would be near impossible to review this album without mentioning what sucked me in, the background music is old folk songs and even a few pop songs here and there. The music which was orchestrated by David Roe and The Orchestra is what really keeps me coming back to this album though, Chris is an amazing storyteller, but the lush melodies and strong musicianship make this one of the better albums I have ever had the pleasure of hearing. We aren't looking at someone jumping on the political music bandwagon here, we are looking at a one man revolution who still tours by whatever means he can, there is no gimmick, there are no tricks up his sleeve. This is what music was meant to be, an honest documentation of someone's life experiences and their thoughts. A lot of modern punk rock bands might talk about the revolution, this man however is living it. While they drive around in their tour busses, this guy is doing it all DIY and doing it ten times better and with more honesty than any "punk band" I can think of today. In conclusion, if you think being punk is doing things honestly that defy the musical and thought paradigm of the day, this is a punk album in every sense of the word. If you think punk is a music made by suburbanite 20 or 30 something pseudo intellectuals, you're going to be dissapointed. This album made me excited about music again, political music especially. If you love music and the power it holds go to his website and order yourself a copy of this album. You won't be dissapointed.